Your heater and air conditioner are absolutely vital to how you and your family use and enjoy your property. If either of these systems operates inefficiently, you waste a great deal of money trying to keep your residence comfortable. If your HVAC system breaks down completely, you will be deprived of the security you expect and deserve in your home. At Precision HVAC, our Woodstock heating and air conditioning contractors are here to ensure that your home comfort system always provides for your needs. In addition to our residential services, our professionals are proud to serve businesses in the Woodstock community. We understand how important your heater and air conditioner are to your commercial endeavors. Our team can be an integral asset to your efforts Our technicians can design, install, maintain, and repair heaters, air conditioning systems and every other portion of your HVAC system. Call Precision HVAC today if you need to hire a professionally licensed heating and air conditioning contractor in Woodstock. Our polite staff would be happy to take your call and to answer any questions that you may have about your HVAC system or our services. We can schedule your service call today. By far, the most important time for your HVAC system to operate efficiently, effectively, and reliably is the winter. If your furnace, boiler, or heat pump fails during the cold season, your property becomes unlivable. The key to preventing heating emergencies is to ensure that your system is always kept well-maintained. 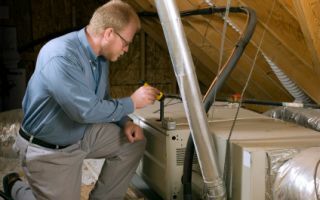 At Precision HVAC, our Woodstock heating contractors specialize in both routine heating tune-ups and emergency repairs. By developing a relationship with our professionals, you put your furnace, boiler, or heat pump in the best position to avoid costly repairs. If your heater every does fail to perform, our technicians are just a phone call away. If your air conditioner is over a decade old, it may be time to start considering replacing it. New energy efficient AC units can reduce energy consumption by over 40% when replacing 10 year old systems. This long-term savings along may be enough to justify to upfront cost of a replacement project. When you hire our Woodstock air conditioning technicians, you are making the best possible choice for the task. Our experts can inspect your property to help you select the most appropriately sized AC unit. We can then install your new system in the most precise manner, ensuring that it is ready to operate a peak performance. If you need to hire a professionally licensed heating and air conditioning contractor in Woodstock, call Precision HVAC today at 845-399-0669, or fill out our online request form.